Blumenthal Performing Arts believes that the performing arts are vital to our community, our economy, our education, and our workforce of tomorrow — and that everyone in our community benefits from Blumenthal as a locus of inspiration, creativity, joy, and celebration. When the Cesar Pelli-designed NC Blumenthal Performing Arts Center was built in 1992, it was a breathtaking example of the confluence of function and design. Now, more than two decades later, it is time to update this crown jewel of Charlotte to accommodate not only the energy of the growing city but also its emphasis on the arts and community. Specifically, we envision an entrance that welcomes and embraces visitors of all types — from the arts aficionado to the passer-by with a piqued interest — who might discover something new, starting on the outside plaza with its cafe meeting place for fellowship and conversation. The entrance itself, proudly and prominently situated at the corner of 5th and Tryon Streets, will offer greater street access, inviting pedestrians to come inside and be amazed, while at the same time providing heightened visibility and ease of use for pickup and drop-off. Inside, guests will find an arts facility updated to be worthy of a world-class city, with expanded space for hospitality and pre- and post-show enrichment activities. The project objective is to create added vibrancy and community spaces on North Tryon with a café that invites pause, outdoor performance stage to entertain, expand hospitality space to steward and cultivate private support from stakeholders, improve access between floors with updated elevators and a new stairway, and to create a striking architectural landmark on the Square. The project scope includes the Belk lobby expansion out toward Tryon St to create an entirely new façade, added event space above the plaza, HVAC improvements to Belk Theater, creation of a new double helix stairway in the rotunda with a public art installation at its base, expanded restrooms, new catering kitchen, new entrance, and digital marquees to enliven Tryon St and 5th St. These necessary enhancements will reinvigorate Blumenthal Performing Arts Center — and Uptown Charlotte — as a destination for incomparable arts experiences that are accessible to all. This will be a significant project to kick-off the revitalization of the North Tryon Street corridor. Originally built in 1927, the Carolina Theatre in Uptown Charlotte is being restored to its original splendor and will soon serve as a dynamic civic hub. The 30,000-square-foot historic theatre was once a thriving vaudeville theatre and silent movie palace that hosted acts such as Bob Hope, Katherine Hepburn and Elvis Presley. Foundation For The Carolinas (FFTC) is now working to restore the long-vacant Carolina Theatre to its original grandeur to create a vital civic engagement space. Construction is currently underway. The Carolina Theatre will adjoin FFTC’s headquarters in the Luski-Gorelick Center for Philanthropy, and will be located in the Belk Place civic campus. The theatre will honor the many contributions of the Belk family, including a lead gift to the restoration project from Katherine Belk and the late Thomas M. Belk, and the late Claudia and John M. Belk. In the 36 years since its opening, Discovery Place Science has become a nationally-recognized hands-on science and technology center serving families, students, adults, and out-of-town visitors of all ages. In that time, renovations have created a complicated internal traffic flow, a programming space with few windows, and a dark front facade. Plus, the demand for science, technology, engineering and math (STEM) programming is growing rapidly, and the Museum must expand to accommodate all the requests for classes, programs, exhibits and services. A redeveloped Discovery Place Science will be a catalyst site in the new North Tryon Plan. A reimagined science center will provide additional space for groundbreaking exhibits, hands-on activities, live animal encounters, and engaging school programs that build critical STEM skills. Visitors will be able to easily navigate the Museum through a centralized entrance, and the experience will maximize use of the facility’s two-block campus. With a new, more permeable frontage on Tryon St., Discovery Place Science will become a welcoming presence that brings science on to the street and people into the Museum. Outdoor spaces with seating will allow for public programs as well as coordination with the new library and Spirit Square experience. Currently, Discovery Place Science is engaged in a master planning process that will analyze the Museum’s future needs, evaluate the current site, engage the community in dialog and review current concepts in experiential design. Discovery Place Science has engaged New York-based Diller Scofidio + Renfro to serve as design architects in partnership with Charlotte’s Jenkins Peer Architects as architect of record. Together this team will present an inspiring conceptual facility design that will communicate the Museum’s mission to provide educational and immersive opportunities in science, technology and nature. This project will replace the Charlotte Mecklenburg Library’s Main Library with a flexible facility designed to meet our community’s evolving information, technology, and public gathering needs today and into the future. The Main Library has been located at 310 N. Tryon St. since 1903, with a building replacement in the 1950s and a significant expansion/renovation in 1988. 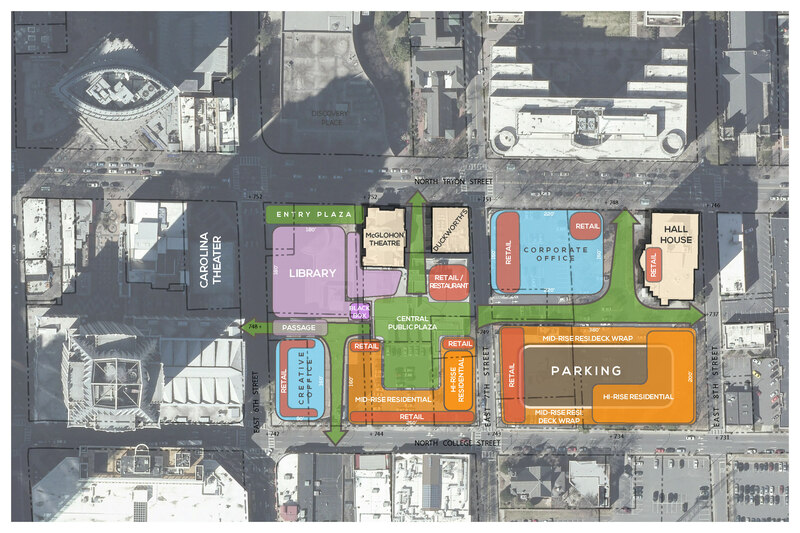 It is a key catalyst site for the North Tryon Vision Plan and Sixth & Tryon redevelopment. The new Main Library will remain at this historic location, where it is poised to become a true public commons: the gateway and heartbeat of the North Tryon corridor; the flagship location for the Library system; the principal local hub of community information, history and archives; and a dynamic destination where all residents of Charlotte-Mecklenburg are transformed into a connected community. Proximity to both public transit and parking will insure that the Library’s resources – and the opportunities they afford – are accessible to people from all parts of the community. Ten Tryon consists of a 30,000 sf Publix grocery store opening to Tryon Street, serviced by an alley extending between 9th and 10th Streets. At the corners of 9th and 10th Streets will be the entrance lobbies to the office buildings overhead. The remainder of the Tryon Street frontage will be small scale retail opportunities insuring the ongoing animation of the main street. A vehicle ramp will take cars from the alley to three levels of parking over the entire base building totaling 334 spaces. Above the parking levels will be two office buildings. The North building at 10th Street, will rise another five floors at 17,000 sf/floor totaling 85,000 sf. The South building will be 7 floors at 16,500 sf/floor totaling 115,000 sf. The terrace level of the South building will feature a restaurant with outdoor and indoor bars, meeting rooms, and a fitness center. The terrace will be available for event space as well as the everyday enjoyment of the tenants. Along with a major grocery store anchoring Tryon Street, the two modest scale office buildings will create alternative style workspace environments totally lacking in the CBD, while offering branding opportunities to entities looking to be part of this unique new frontier. between 9th & 10th St. Seventh & Tryon will be a new Uptown landmark in Charlotte, North Carolina that is economically successful and architecturally iconic. It brings jobs and vitality to the central business district and provides housing options affordable to a range of income levels. Seventh & Tryon’s mixed-use, mixed-income neighborhood will create an opportunity for the community to come together in inspiring ways. The project is poised to play a catalytic role in accelerating the development of Charlotte’s vibrant North Tryon District. The Seventh & Tryon blocks are exceptionally positioned to capitalize on the vibrancy currently taking place in the area. The concentration of redevelopment and cultural resources in and around the Seventh & Tryon site adds to its potential as a place connected to institutions of learning, culture and civic engagement. Market 42 is a mixed-use development encompassing nearly a full city block. It will include a 33-story luxury high-rise residential tower, a 7-story mid-rise residential building, and over 19,000 square feet of street level retail. Public spaces will include an intimate courtyard with a water wall and a new private street which will be programmed for farmers markets, food trucks, art festivals, and other events.